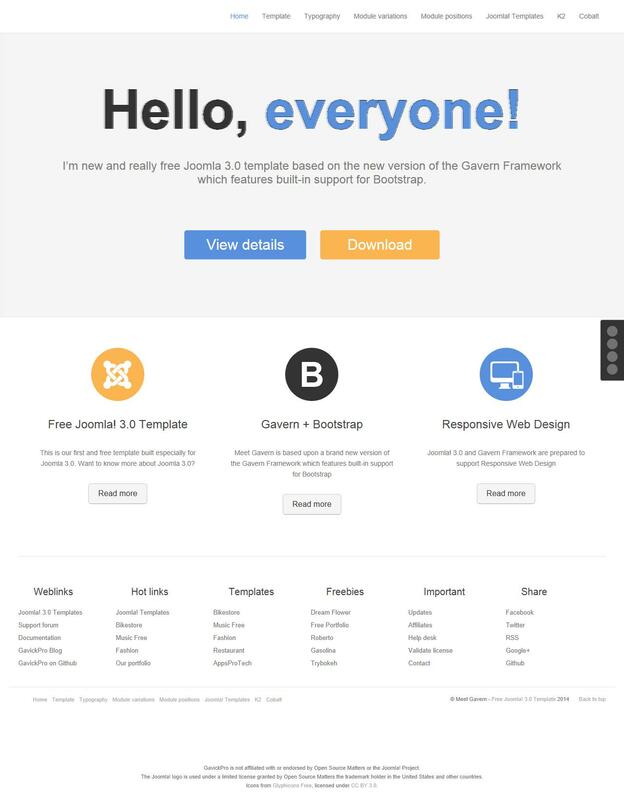 GK Meet Gavern - one of the first template with support for Joomla 3.0 from the design studio GavickPro. Pattern characterized by bright colors, comfort and modern design. This template works on the latest proprietary platform Gavern Framework, so pretty fast and easy while loading. Has several color schemes, flexible system configuration template design, support different fonts, a set of social icons, support for modern technologies HTML5 and CSS3, allowing presentable to provide information in all modern browsers, as well as on smartphones and tablet devices. The template is fully adapted for mobile devices thanks to new engine Joomla 3.0, which is scheduled for September 2012. The developers promise to release a stable release of the new version of CMS to further improve its framework.